With 2014 just a few weeks away from us and the promise of Spring brights bursting onto the scene , I had to share this exciting colour palette preview with you from the world leaders in colour direction, Pantone and one of their top 10 colours for SS2014. 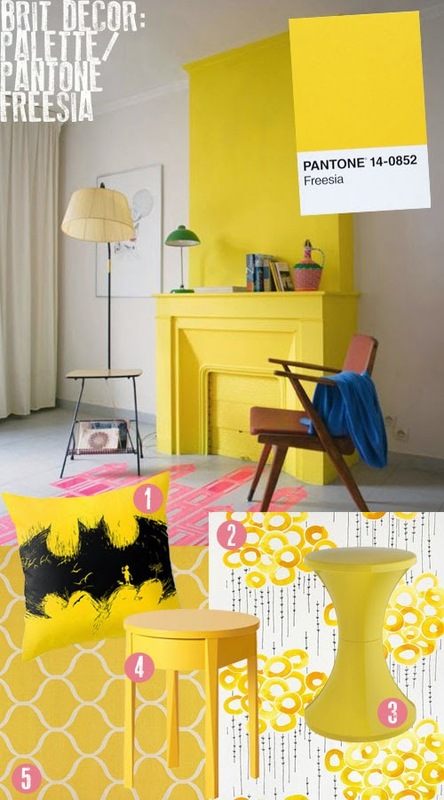 Personally, I cannot take my eyes away from number five on the list, 14-0852 Freesia Yellow. I love how the chimney breast 'above' is elevated by the sunburst yellow paint which is so deliciously bright and inviting. The brightness and intensity of this florally inspired colour makes it the perfect choice for creating a statement and I am really excited about some of todays picks, which are sure to be the first of many freesia inspired home products for the New Year. What better way to kick off this colour inspired shopping trip than this gorgeous Anyone Here? pillow by Peter Goes (no.1) from Society6, sporting the eye-catching combo of black and yellow. The warm golden tones of the Stockholm fabric (no.2) makes this value textile a fantastic gem especially when paired with the buttercup brightness of the bedside table (no.4) of the same name and both of these finds are from IKEA. The classic design of Habitat's perfectly formed Tam Tam stool (no.3) looks so energised in yellow whilst IKEA just keeps on delivering the goods for this palette with their elegant Stockholm rug (no.5) - sure to elevate any floor in this colour!